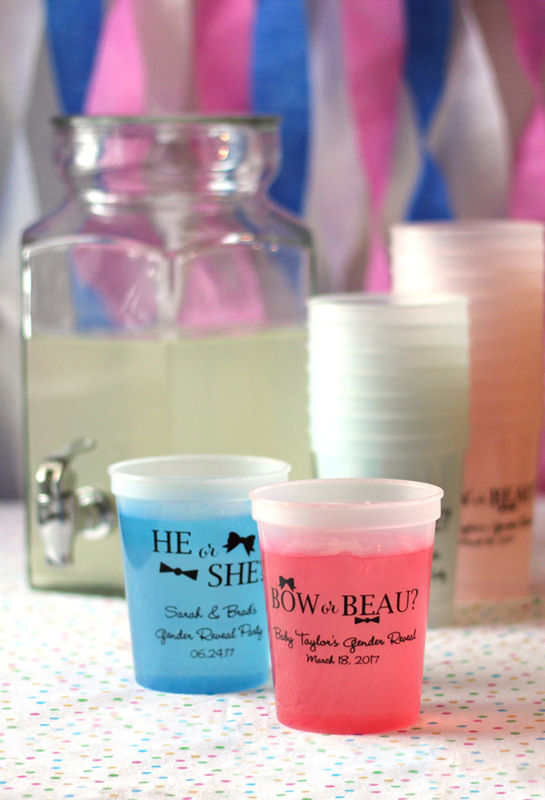 Add whimsy and mystery to your gender reveal baby shower with these fun 16 oz color changing plastic cups. Once these cups get cold they show off their true colors changing to either blue or pink. Just add a cold beverage. Great for setting next to the punch bowl for an alternating blue and pink color scheme to accent a gender reveal baby shower party. Personalize with a baby shower design and up to three lines of custom text. All orders will be shipped with half blue cups and half pink cups. These cups are NOT recommended for the actual reveal. Cups carry a slight tint before use that will give away their color. Add cold drinks to see the cups intensify in color. The colder the liquid in the cups, the more intense the color will be! All orders will contain half blue cups and half pink cups. I ordered these color changing cups for a gender reveal we will be having on March 24, 2018. They came out beautifully. IÃ¢â‚¬â„¢m sure the guests will love them. First I want to say that these turned out great. I made them for a friendÃ¢â‚¬â„¢s gender reveal and she loved them too. Second the service was amazing! I opted for the speedy service and really it is worth it. Everyone LOVED these cups and wanted to take several home to show off to their friends. The parents loved that they were personalized with their name. I would definitely order these again! Loved the cups I ordered. Good quality product. This was my first time ordering through this company and I will be back. The customer service was excellent. I was mistakenly sent the wrong cups. Once I made them aware they send me the correct cups and the response time was very timely. My family loved these cups and they made great party favors. Everyone wanted to know where they came from. And I referred them. I'm definitely ordering from this company for my baby shower. I am so happy I stumbled across this site. Super cute, drinks need ice to really get the full effect. We had these at our gender reveal party and everyone loved them! We didn't use them as the actual reveal.. more so as a fun decoration. We received a few extra ones and none were broken! The cups are absolutely wonderful! Everything was perfect! Thanks Tippy Toad! Product comes as pictured & we were happy with the cups. The only issue I found it that we had about 5 that were broken around the rim so we couldn't use them. Make sure to get a little more than you need. These cups were so cute and wonderful to have. Everyone loved them. Shipping was fast. Customer service was AMAZING!!! Definitely will order from this company again. Cups were so fun! Everyone loved them and the printing was great! I forgot to order my cups until the last minute, and they still got here in time. Everyone loved the cups, myself included, and I couldn't be happier with the result. Thank you for everything! 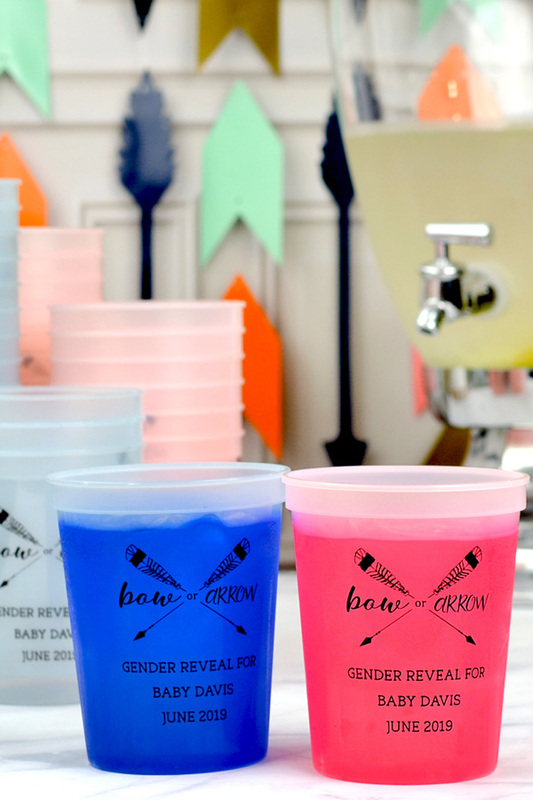 I ordered these cups for my sister in laws gender reveal party and they were such a hit! It was wonderful for everyone to be able to take home a little personalized gift from the party. The cups turned out perfectly and I will definitely be ordering from TippyToad again in the future!! Loved these cups! Changed to a perfect color of blue and pink. 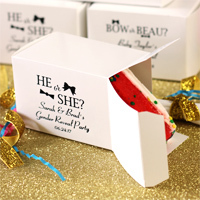 These are a must for gender reveal parties!